Far North Dallas Richardson Democrats – Come help us get things done! To identify, recruit, encourage, and vet local residents who would make good candidates to consider running for local political offices such as School Board, City Council, State Representative, Congress, etc. Precinct Chairs in the 1800 precincts of HD 102 were the starting point of the club. In early 2004, North Dallas Democrats HD 102 (NDD102) was founded by Anthony Pace, Precinct Chair 1811, and Robert Franklin, Precinct Chair 1802. The first event held by the fledgling club was a Primary Forum at the Fretz Park Recreational Center in 2004. This became the Club’s signature event and was held again in 2006 and 2008. NDD102 in 2004 primarily focused on Harriet Miller’s Race for State Representative and Martin Frost’s Congressional Race. Although both races were unsuccessful, they served as a starting point for activism in HD 102. In 2006, the club was again involved with Harriet Miller’s second attempt to win in HD 102. In 2007, the club recruited Carol Kent to run for State Representative. Club members formed the initial campaign team. Anthony Pace was the initial campaign manager, Janice Schwarz, Precinct Chair 1809, was the field director, Lenna Webb was the campaign treasurer, and both Bob Franklin and John Knutson, Precinct Chair 1806, served as advisers to the campaign. FNDD’s role in Carol’s election in 2008 was one of the greatest accomplishment of the club to date. The Club continues to focus on identifying, recruiting, and supporting candidates in our area. 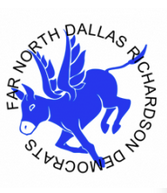 The club was renamed Far North Dallas Democrats (FNDD) in 2009 to reflect the club’s focus beyond House District 102. In 2012, the club merged with the Richardson Democrats and we continue to grow each day. Come join us!